A web-based prepaid SMS solution that allows you to broadcast short messages to a targeted base instantly or by schedule. Pay as you use model–businesses only pay when they need to send messages. Businesses can send the message with their branded identity (e.g. company name). Contact lists can be uploaded via csv files for targeted broadcasts. Able to extract contacts from address book and upload external database via csv files. Allows monitoring and tracking of individuals and companies. Messages can be sent using your company’s branding for instant recognition. Users can create personalised messages using the templates available for mass mailings from a database mailing list of names. You can manage the date and time to send messages to your target audience. Message templates are available for easy mail merging and messaging. Low cost to reach out to large groups of target audience quickly. Prepaid or pay-per-use options allow control of advertising budget. Does sendQuick allow me to do my own company's branding? Yes, you can set the CallerID to your company's name if you like. i.e. ABC Company and messages sent out will be reflected as a message from ABC Company. Does sendQuick allow me to send from my external database? Yes, you can. Simply upload a csv file of your database onto the portal. How fast does sendQuick take to send out the messages? 2-3 messages will be sent out per second. How does the 2-way messaging work? You send a promotional message via SMS to your customers and they can reply you instantly. Your customers can unsubscribe directly from receiving your SMS in future. This reduces their inconvenience in trying to reach you via other modes to unsubscribe. This feature allows unlimited incoming SMSes, which means you can publish it anywhere for customers to reach you instantly. It comes with 500 outgoing SMS credits (one-time) for you to reach your customers. What do I need to tell my customers for them to reply an SMS, such as notification to be unsubscribed from my marketing list? 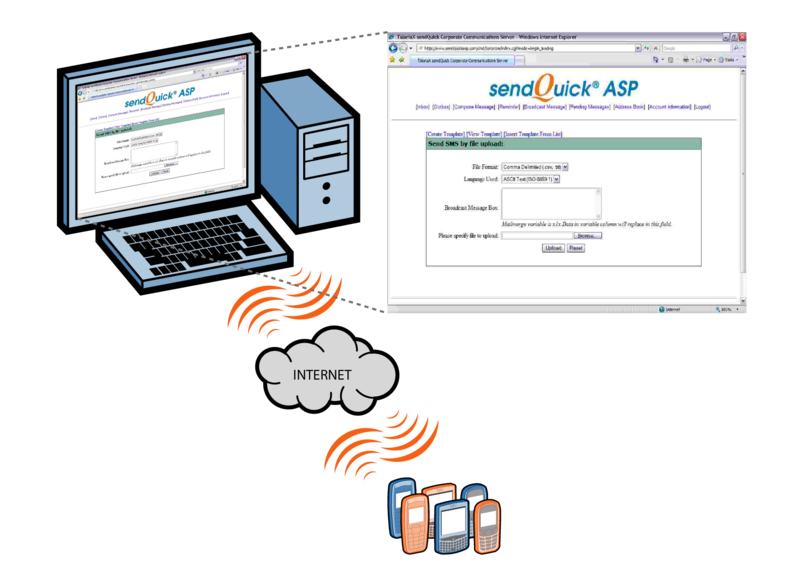 Upon purchase of sendQuick, we will take up to 3 days to provision you a dedicated number, which will be communicated to you on email. You can embed this number in the SMS you send out, or use it as a Caller ID instead if you want your customers to reply to your SMS. For example, if your assigned number is +65 91234567, and you set your Caller ID as ABC Company, you can add "Reply UNSUB to +65 91234567 to unsubscribe" to the body of your SMS. Can I use sendQuick to send messages to overseas numbers? Yes, you can use sendQuick to send messages to Australia and Asian countries, excluding Japan and Korea, at the same rates. Messages to other countries will be charged at different rates. Is there any Spam Control Act on SMS marketing? As such, for Starter pack users, you will not be able to receive opt-out responses. You are required to set up other channels (such as email or website) for customers to unsubscribe from your future SMS marketing activities. Other than the cost of using sendQuick, do I need to pay any additional charges to the telco operators? There will be no additional charges. Charges to telco operators are included in the package. Does sendQuick provide 3rd party databases? No, sendQuick does not provide databases. TalariaX is the developer of sendQuick, the industry's leading SMS gateway providing enterprise messaging solutions implemented by more than 1000 companies worldwide.